Decent, affordable housing is important to families. Certainly, it fulfills a basic human need for shelter, but it also contributes to the well being of both parents and children. Studies show that children in stable housing do better in school and are less likely to experience disruption in their education due to unwanted moves. Decent, affordable housing reduces stress, toxins, and infectious disease, which leads to improvement in both physical and mental health. Affordable housing also frees up funds within families’ tight budgets to spend on health care and food. Studies have shown that children whose parents receive housing assistance benefit from better nutrition. For parents, living in decent, affordable housing also means reduced stress due to a lessening of concerns that high housing costs will lead to foreclosure and eviction; this in turn leads to fewer physical and mental health problems and reduced absenteeism on the job. Affordable housing also is important to the economic vitality of communities. Affordable homes can attract and retain employees to your community- a selling point and a competitive advantage for area employers. Affordable homes also support the local workforce so they can live close to their jobs. Shorter commutes allow workers to spend more time with their families while the community benefits from reduction in traffic congestion, air pollution, and expenditures on roads. In revitalizing communities, the construction of affordable homes can also help to stimulate economic growth. A healthy mix of housing options, from market- rate and affordable rental housing, single-family homes, duplexes, as well as developments for seniors, ensures opportunities for all individuals to improve their economic situation and contribute to their communities. Under the newly adopted 2015 Housing Opportunity Ordinance (“HOO”), developers of multi-family housing have the obligation either to build affordable housing on site or to pay an in-lieu fee which will fund off-site units. The funds provided to the City must be used to provide affordable housing options for Santa Ana residents, and cannot go toward any other use. The fees for affordable housing benefit are only imposed on multi-family development. the community would see no financial benefit for affordable housing in Santa Ana. For the first time since the recession, U.S. household income increased significantly during 2015. Gains were seen even among the lowest income households, with the poverty rate declining from 14.8% to 13.5% (Proctor, Semega, & Kollar, 2016). Millions of people, however, continue to struggle economically. Household income for the poorest 10% of households remains 6% lower today than in 2006, and more than 43 million Americans remain in poverty, many of whom struggle to afford their homes. Each year, the National Low Income Housing Coalition (NLIHC) measures the availability of rental housing affordable to extremely low income (ELI) households and other income groups (see Box 1). This year’s analysis is slightly different from previous years in that NLIHC adopted the federal government’s new statutory definition for ELI, which are households whose income is at or below either the poverty guideline or 30% of their area median income (AMI), whichever is higher.1 Based on 2015 American Community Survey (ACS) data, this report provides information on the affordable housing supply and housing cost burdens at the national, state, and metropolitan levels. This year’s analysis continues to show that ELI households face the largest shortage of affordable and available2 rental housing and have more severe housing cost burdens than any other group. 11.4 million ELI renter households accounted for 26% of all U.S. renter households and nearly 10% of all households. The U.S. has a shortage of 7.4 million affordable and available rental homes for ELI renter households, resulting in 35 affordable and available units for every 100 ELI renter households. Seventy-one percent of ELI renter households are severely cost-burdened, spending more than half of their income on rent and utilities. 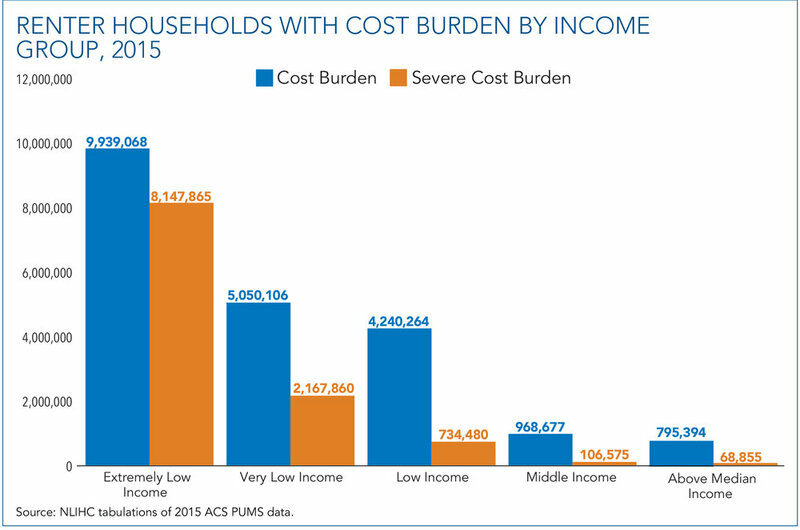 These 8.1 million severely cost-burdened households account for 72.6% of all severely cost-burdened renter households in the U.S.
Thirty-three percent of very low income (VLI) renter households; 8.2% of low income (LI) renter households, and 2.4% of middle income (MI) renter households are severely cost-burdened (see Box 1). ELI renter households face a shortage of affordable and available rental homes in every state. The shortage ranges from just 15 affordable and available homes for every 100 ELI renter households in Nevada to 61 in Alabama. The housing shortage for ELI renters ranges from 8,700 rental homes in Wyoming to 1.1 million in California. California's high housing costs have pushed many tenants to the edge of affordability. Even if they have steady work, the cost of putting a roof over their heads demands a staggering share of income. The problem has been building for decades, a result of rising rents and stagnant income for many lower- and middle-class workers as the economy shifted away from manufacturing to create a legion of low-wage service jobs.